In emergencies, there's no time for rescuers to worry about their technology. They need to communicate seamlessly across multiple agencies and jurisdictions to mount an effective joint response. MOTOBRIDGE is a scalable, cost-effective IP-based solution for quickly establishing communications between disparate systems in support of emergency response and day-to-day operations. MOTOBRIDGE provides connectivity to any disparate radio system, all with the same gateway unit. Systems that support the P25 standard, as well as other technologies, can be linked together for interoperable communications. 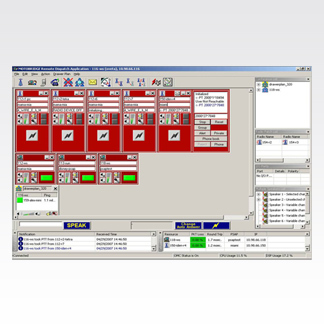 Connects users from different departments to each other's remote command & control and dispatch facilities. Joins your existing consoles to add basic joint dispatch capabilities. Captures and plays back up to 30 days of audio and system data in the same intuitive dispatch GUI format. Disperses system, with no central audio switch and no single point of failure. Sustain established VoIP communication and remain un-impacted if dispatch PCs or management servers fail. Radio and telephone patches are automatically re-connected within 30 seconds if a gateway loses power. Supports enhanced call signaling, enabling uninterrupted use of key features such as Emergency ID. Runs on any standard IP backbone to fit the resources available in your area. Protects from scanners and unwanted people from interrupting transmissions. Shelters the network from hackers and other unauthorized access. Makes the solution more cost-effective and scalable, supporting an unlimited number of users on a single network.